Dreaming up new recipes, then testing and refining them, is one of the most rewarding and interesting things I've done in my life, and describing these dishes to readers of this blog comes a very close second. I am excited to share this recipe with you: it's the culmination of my recent kitchen experiments involving slow-cooking of leeks (a passionate outburst of leek braisery, in other words). Braised Baby Leeks with Halloumi 'Popcorn' and Frizzled Prosciutto. Leave out the breadcrumbs if you're on a low-carb regime. The leek may be a humble vegetable, but it is capable of great nobility, if it's cooked just right. The French refer to leeks as l'asperges du pauvre, or 'the asparagus of the poor', and it's not difficult to see why. Young, tender leeks very slowly and gently softened in butter, or braised with white wine and herbs, are delicate and delicious. The challenge, though, is to find really good young leeks: most of the elderly specimens sold in South African supermarkets are tough, stringy and suitable only for tossing into a chicken stock, or making humdrum vichyssoise. If you see baby leeks in your local greengrocer, make a dive for them, and energetically slap anyone who gets in your way. 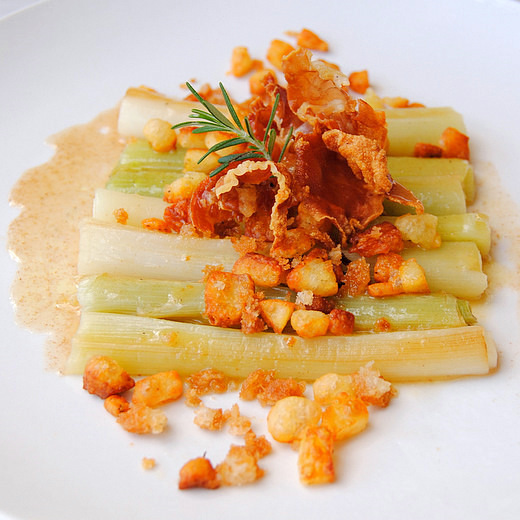 Braised baby leeks have a lovely melting texture, so they need to be paired with something with crunch, crumble and snap. In this recipe, I've gone for all three: crisp breadcrumbs, puffy deep-fried bits of halloumi cheese, and frizzled prosciutto. If you're on a low-carb regime, leave out the breadcrumbs. Halloumi is a tricky cheese to fry: if you haven't cooked it before, have a look at my tips for perfect results with halloumi. Two more recipes with braised leeks: Wine-Braised Baby Leeks in Crisp Prosciutto and Salad of Warm Baby Leeks with Blue Cheese and Chilli Croutons. Rinse the leeks and trim off the roots and the dark green leaves. Heat the butter over a medium-low heat in a large frying pan and add the leeks, rosemary sprig and garlic halves. Cook gently, tossing frequently, for 6-7 minutes, or until the leeks are beginning to take on a little golden colour. Don't allow the garlic to brown. Add the wine and water, and season with a little salt and milled black pepper. Cover the leeks with a cartouche (a cut-to-size circle of baking paper, or the wrapper from a block of butter). If you don't have baking paper, place a lid, at a slight tilt, over the frying pan. Now turn the heat down to its lowest setting and braise gently for 15-20 minutes, or until they are very tender and the liquid has reduced to just a few teaspoons. If the pan looks as if it's drying out, add a little more wine. Turn up the heat again and add the lemon juice and olive oil. Bubble for just 30 seconds, then remove the pan from the heat. Check the seasoning. While the leeks are braising, prepare the toppings. Pour enough oil into a small frying pan to cover its base to a depth of 1 mm, and set over a medium-high flame. Whizz the bread slices in a food processor until you have rough crumbs. Fry in hot oil until golden brown, then drain then on kitchen paper. Now fry the prosciutto slices until they are crisp and golden, with frizzled edges. Drain. Immediately before you serve the leeks, make the halloumi 'popcorn'. Pat the halloumi quite dry with kitchen paper, slice it thinly, then cut each slice into a very fine dice: each piece should be about the size of a lentil. Add more oil to the pan in which you cooked the breadcrumbs (the oil should cover the bottom of the pan to at least a depth of 2 mm). Turn up the heat, tilt the pan, and add the halloumi bits to the 'deep end', in small batches. As the pieces of cheese puff up and turn a light golden brown, remove them from the pan with a slotted spoon and drain them on the kitchen paper. Watch them like a hawk as they darken quickly, and will continue to cook after you've removed them from the heat. Fish the braised leeks from the pan and arrange them on a large platter, or on individual plates. Pour the braising liquid over the leeks. Scatter over the breadcrumbs and halloumi bits, and arrange the fried prosciutto rashers on top. Garish with a sprig of rosemary and serve immediately with bread. Oooooh, this looks great! Such a fabulous idea of pairings and textures. You're so right about the faux "baby" leeks in supermarkets... I will definitely keep an eye out for the real kind, and am ready to slap away! Delicious, this is a dish that could be served in any fine restaurant as a wonderful starter- I would certainly order it! And 'energetically slap' anyone who tried to stop me!! hee hee! Thanks for your comments, and good luck with the slaps. Love the crunchy bits you've added here. Made these tonight sans the topping and served em with fishcakes from Ocean Jewels (bought at Starlings market)- perfect match! Loved the creaminess of the leeks and tang of the sauce. Thanks J-A. What a fabulous combination! So mouthwatering and tasty. @Marisa I am sure you would never slap a random stranger. An annoying colleague, maybe, yes. @Gillian Thank you! I'm so glad they turned out well. Brilliant idea to pair them with fish cakes. Where's Starlings market? Find out about my cookbook: Scrumptious Food for Family and Friends: behind-the-scenes insights, the latest reviews, and where to find it.